Today $2000 was invested in the following stocks. Several variables went into selecting a few, including starting yield, payout ratio, dividend growth, and historical stability. I loaded up on heavier yielding players to try to boost my portfolio up. MO - 14.3% (they had an irregular hike due to the tax cut, usually they have been very consistently 8% y/y hikes). For utilities, I did not add to D because the payout ratio is close to 90%. I find they are too aggressive on the dividend policy. NEE is the most conservative and it's growing fastest, although it's a lower mid 2% yielder. WEC and XEL hit the sweet spot (normal) dividend growth range that I like while maintaining a decently safe payout ratio for a utility. I want to load up on higher yielding companies so that I can start purchasing more low yield high growth companies, ones like UNH, TJX/ROST, V/MA, SYK, etc. Overall my sweet spot I am targeting (in today's environment) for my portfolio is a 3% yield with 8% growth for a total income growth of 11% with dividend reinvested. In disappointing news KHC cut the dividend severely down to 0.40 per share per quarter. The stock price fell 28% in the open. I have sold my KHC, all of it. I have added new capital and invested in other companies to boost the dividend back. The position is less than 0.50% of my portfolio and I will record the dividend loss on my year over year chart to show the poor performance. KHC is still a profitable business but the management at 3G have largely disappointed me. KHC will still remain for many decades in my view and I believe it can crawl back. My problem is mainly with 3G management and this is why I sold. The industry has large secular head winds and 3G's aggressive take on debt and use of acquisitions + debt + laying off people to expand the company is not working well especially when the brands they buy are in secular decline. The company is relying on a lot of cost cutting and firing of staff, which will ultimately hurt innovation and growth. 3G has also underperformed my indirect position in BUD (owned through Altria). They have destroyed a lot of value in my portfolio. I have lost a lot of money on KHC over the years. I took my losses, will tax loss harvest some of the amount, and use the $2400 in proceeds to buy new stock. I infused $7000 of cash into my portfolio. I bought a lot of Boeing and a very few of Altria and WEC (a utility). My boeing position is now $9284. The lesson learnt here is that not even boring 'stable' food stocks are safe. Dividend cuts also stress the importance of diversification. This dividend cut on my tiny $2000-3000 position in KHC is a non-event. My overall portfolio dividend actually went up as I purchased a lot of new companies this week. However if a dividend cut happens to one of my large positions in the $20K or $30K size then it will hurt, but still not be the end of the world as my portfolio is now sitting around $630K. Trends change and companies have to keep up (like technology) or die. I am taking a deep look at other types of consumer staples like GIS and drinks like KO/PEP. I think PEP is in a good spot as snacks do not fall under this category and are actually growing with the millenials. It's the whole healthy eating, organic, and fresh food category that is killing old consumer packaged goods companies like Campbell, JM Smucker, GIS, and KHC. I am also looking closely at traditional safe consumer stocks that are not food related like PG and KMB and CL as their growth has largely stalled. I am worried about off-brand products being competitive and Amazon starting their own essentials lines. The S&P500 has recovered very hard since the lows of December. The interest rates also remain noticeably lower. Lower interest rates help dividend paying stock prices rise. And overall, lower interest rates are good for stimulating the economy. Oil prices remain depressed. My investments do not involve any oil so I am not impacted. The low price in oil to me is positive as it lowers the input cost (i.e. plastics, chemicals, shipping freight) for a lot of the businesses I own shares in. The dollar continues to be very strong, this is good for when I travel abroad but not good for the multinational companies that I own shares of. When these multinationals have to bring back money earned from selling overseas, the high strength of the dollar makes the earnings received back in the states lower than if the dollar was weaker.. I added the following today to my portfolio. Around $7500 was put to work. My cash position is now around $15K. It's a start of a new year and I wanted to take a step back and list out for readers and myself (again) about my goals and what I am doing to make it happen. I think it's good to write down over and over to remind oneself what one's goals and planned approach is. That way the philosophy is ingrained in one's mind. There will be times when situations get tough or one is tempted to try something more exciting. In the long run discipline is the most important aspect that has allowed me to get to where I am today. In this post I'll summarize a little about my investing habits. The reason I dedicated so many years to investing in myself is independence independence independence. Freedom is very important to me. I cringe at the idea of having to rely on another person or organization for survival. I want to be able to stand on my own two feet and control my destiny. I want to be able to do what I want to do, work where and how I want to work, associate myself with people I want to be with, go where I want to go, be myself and not have to impress others, etc. This desire for independence has caused me to save and invest religiously over a decade ago. Having money to buy material objects (houses, cars, jewelry, iphones, clothes) is not important to me, I just don't get enough of a lasting impact from these purchases. The importance of money to me is the creation of options and freedom and control of my destiny. I like to be able to sit down, look at my choices, and pick what I like. Without resources, one has limited options. One is forced to comply with the system, forced to (potentially) work in an arrangement that one doesn't completely agree with, or to summarize it all quickly, live a life one isn't completely happy with. To me, this freedom and choice of options is what makes me happy. I began investing while in university when I was 19. Finances were tough and I often had little to buy food or rent. I worked part time while studying full time. I saved the excess cash and invested it while using the part time job to pay for the school and expenses. I enrolled in a technical major that I hoped one day will be useful to the current economy. Before taking a class I always asked "how can this help my future employer" or "how can I use this for my own business in the future". Since I had to pay my own tuition and living costs, I wanted a good return on my investment and tried to get most out of my school years. I wanted to minimize the debt hole I was digging for myself in college. For those applying for school in the future, having a clear goal and direction and financial plan before proceeding will save you much financial grief. I would try as much as possible not to fall for the classic debt trap that many graduates sign up for. Know what you are signing up for before agreeing to a loan or major. Getting (paying) for a degree is just one part of life and just the beginning, it will only open a small door when you try to get that first job to set your foot in the work force, but it is not the panacea for everything. I graduated at 23 and went to the work force in technology. Due to my part time job and summer work while studying, I graduated with no debt. All my assets and investments earned while working part time were sold to pay off all remaining expenses for school and move to my new employer's city. Once employed full time, my savings rate and investing rate multiplied many folds due to the salary compared to my non-professional years. While many of my friends or colleagues saw the surge in income as an opportunity to purchase nice cars and goods, I took a 180 degree approach and invested heavily. For every dollar I try to get at least a 2.6-3% average dividend yield and a 9-10% dividend growth rate every year. That means for every dollar, I will get 3 cents per year. And every year that 3 cents will grow to 3.3 cents and so forth. This may seem small, and at first I thought this was completely pointless, but over many years the amounts seriously start to add up. After 5-6 years working full time and saving and investing continuously, I have saved up around $600,000 in assets and cash. Right now my portfolio is generating $16,600 in dividends a year. The amount my investments can generate in income is starting to make a dent. $16,600 can cover a lot of my living expenses and I can already feel my independence progress moving in the right direction. With $600K in assets I no longer feel as worried if my employer lays me off or if my car breaks down or if I need to visit a relative overseas. I feel now I have more control over my life than when I graduated with nothing. This $16,600 is going to grow around 10% every year on its own, or $1660. With the 3% dividend reinvested back, I expect my annual income of $16,600 right now can grow to $18,758 in 12 months if I do completely nothing. Dividends and dividend growth are two compounding work forces that I employ to grow my wealth. The price of my assets is secondary to the income, income is everything and if the income continues to rise and is safe, the price of my assets will eventually follow. Price is random and moves at the whims of the market. Income or dividends are very concrete and must rest on the fundamentals of a business. As a result I spend considerable time making sure my assets are capable of paying their dividends even in tough environments. Most will look at my portfolio's 3% yield as being very low. Renting out real estate can yield over 5% (this is an active job though), and CDs today can yield values this high now. The one thing people overlook is the growth of that 3% every year. Dividend growth is the second lever in the compounding strategy that is very powerful which most overlook. My portfolio dividend has grown around 10% a year by itself. With that 3% dividend yield reinvested I am getting nice double digit income growth year after year. This rate of growth has also historically been achievable when I researched the returns from the types of stocks I invest in today back to 1987 (30+ years). Rental real estate income does not grow this fast and requires a lot of management work, and bonds and CDs and treasuries don't grow in income year after year. For reference, a 12% income growth (3% dividend yield + 9% dividend growth annually) will cause the income to double every 6 years. My portfolio today generates income of around $16,600 a year. This may be insignificant to some. 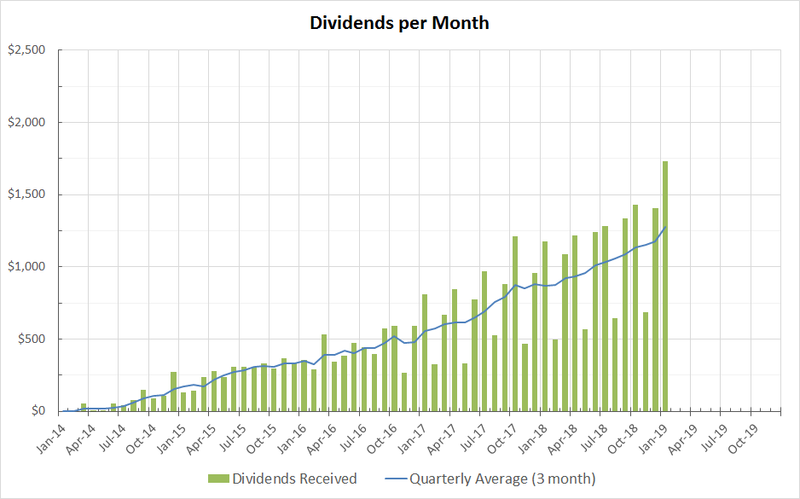 However In 18 years (when I am 46 years old) the doubling really kicks in and this income I estimate will be around $132,000 ($16,600 * 2 * 2 *2), this dividend growth will come without me having to contribute any new capital. If I invest every month at my current rate, this income in 18 years will be many times higher. The key here is that money invested a long time ago will be able to produce huge amounts of income and assets invested recently will be generating small incomes. Time is the most important asset in this whole strategy, which is why I started investing around a decade ago when I was 19. I won't go into full stock picking strategy here. I recommend new investors to familiarize themselves with the dividend aristocrat list (companies that have been paying rising interest rates for 25+ years). I would memorize all the companies of major corporations that have strong dividend histories. And then analyze their past growth rates of the dividend and earnings, look at the payout ratios trend, and read up what types of businesses they operate. Know as much about the weaknesses in the business and strengths before you buy. Knowing enough about the business will allow you to hold it through tough times when prices drop 30-50%. Misinformed buyers will panic and sell as they will not be comfortable. This is why I do not like index investing, you do not know what you are owning and as a result you have nothing to fall back on when your index falls 50% during a market recession. You will want to hold your purchases forever and let the income compound on top of itself. Many sell when times get tough but in the long run a diversified set of stocks will outperform any other asset class so staying the course is a tough but mandatory discipline requirement. I would monitor the previous performance of a company over 20 years and see how they behaved during recessions. Although past performance does not predict future, a lot of companies progress into the future in a similar manner as they did in a past. When analyzing future candidates, one reads the resume of his past performance; I take a similar approach to researching prospective companies on what I can expect from their past. I like companies that have rising earnings and dividends even during recessions, I like those that are consistent and don't have spikes up and down, I like those that are predictable and boring and consistent. My preference is to focus on less cyclical businesses. Defensive types of business are consumer staples, utilities, and healthcare. These businesses offer products and services people will buy even in hard economic times. I want the dividend I invest in to be safe. I like to ask myself "if I lost my job what products and services will I still buy". These are the types of businesses I like to invest as they are sticky and the earnings are consistent. Cyclical businesses I tend to focus less but they offer strong growth when the economy is good. These include industrial companies and materials and energy. It's good to have a good balance among all the market's sectors. Sometimes institutional investors will perform sector rotations and it's better to control risk with diversification. Compared to previous months, January was a large spike upward in cash dividends received. This is because I made heavy contributions to my portfolio late in Q4 of 2018. I expect February and March to be relatively uptick as well compared to previous quarter. I received $1729 total in January. For February I am expecting $910 and March around $1600.